Having a ton of options can be great, which is exactly why everyone should thank the Industrial Revolution for inventing the Cheesecake Factory. 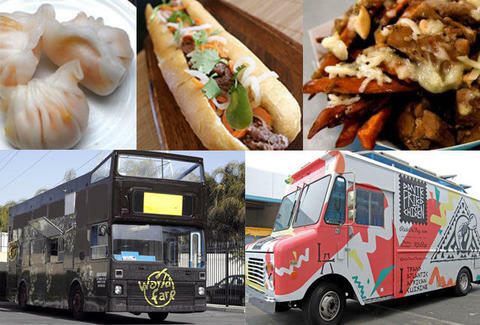 For an event that eschews quantity for awesomety, check out Thrillist's Best of the Best Food Truck Rally. The first-ever local foodie event from Frank Stallone's favorite email newsletter, the BOBFTR's an all-inclusive smorgasbord of revelry, wherein a suggested $5 donation to Meals on Wheels West scores you gratis drinks, music, and grub from a carefully-curated selection of four of the best Twittering LA food trucks, plus one food bus, or as it's more formally known, one food Jerome Bettis. Each wagon's serving up their best dish, with everything from bacos from Lardon, to spicy chicken tacos from Komodo, to the Dim Sum Truck's shumai dumpling w/ pork, shrimp & mushroom, to Frysmith's rajas fries, to fried chicken and coconut honey biscuits w/ apricot hot sauce from Dante Fried Chicken, where your belt will be the ultimate ring of hell. To help you digest, there's a bar with drinks from the sponsors, tunes from DJ Franki Chan, as well as live hip-hop from Pigeon John, who's undisputedly the sh*t. In addition, there'll be a Twitter contest to crown a champion among champions -- a difficult decision given that none of them even have Carmel Pecan Turtle Cheesecake.